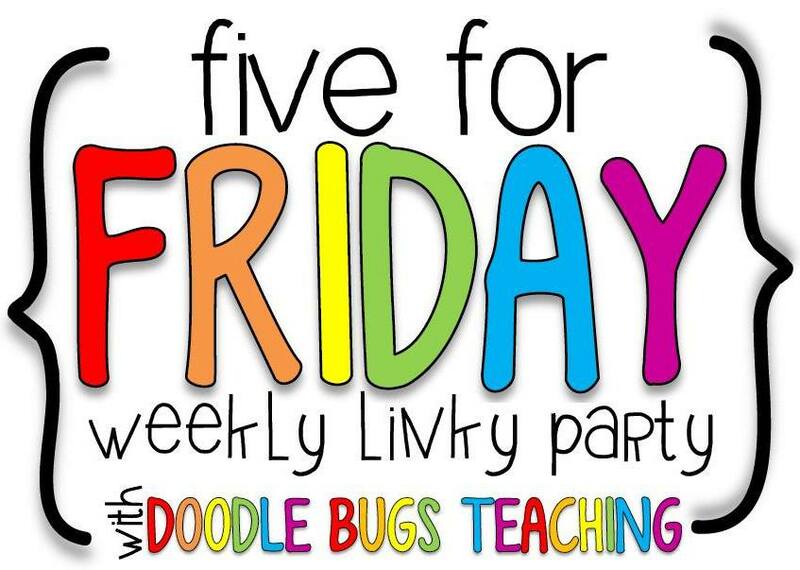 Today I'm linking up with Doodle Bugs Teaching for 5 for Friday. I've been working hard to clean, organize, and decorate my classroom all summer long. 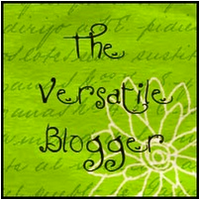 Things are finally coming together and I have a few items that I'm ready to share with you. I got adorable fish bowl cutouts from Carson Dellosa and I printed out our job titles to staple beneath them. I also printed out fish graphics from Krista Walden and have each students' name on one. I used Velcro to stick the fish to their bowls. I can easily move students to a new job each week. 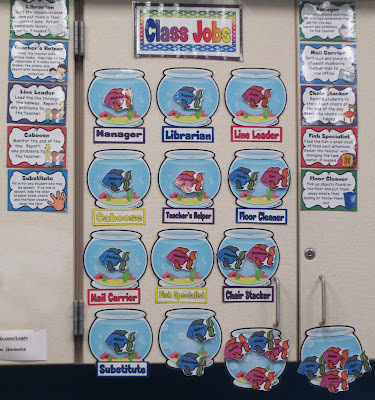 Job descriptions are printed and posted to the left and right of the class jobs display so that students know exactly what is expected of them. One important job is our class manager. 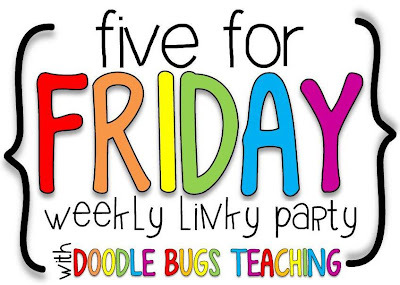 Each day they check off when students have completed their job for the day and help remind students if they forget. 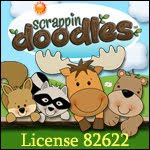 This keeps our class jobs running smoothly. I love the book bins I got from Really Good Stuff a few years ago. I reuse them each year and they are holding up pretty well. I got these cute name tags from Carson Dellosa so that each students' bin is labeled. 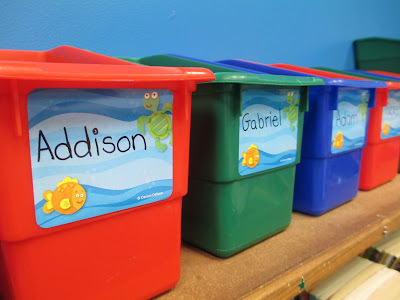 Students will keep their reading folder, reading journal, and class books in their bin to use during reading centers. This keeps their books from getting smushed and ripped inside their desk. To coincide with our fish theme, I found these lovely stuffed fish at the Dollar Tree. We will use blue for boys and orange for girls. 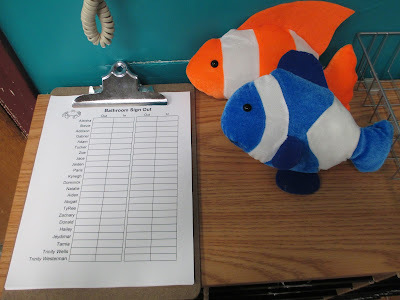 When a student needs to use the bathroom they simply sign out and place the fish on their desk. This signals other students that a boy or girl is already out (only one may go at a time unless there is an emergency). It is also a quick visual for me as to who is out. 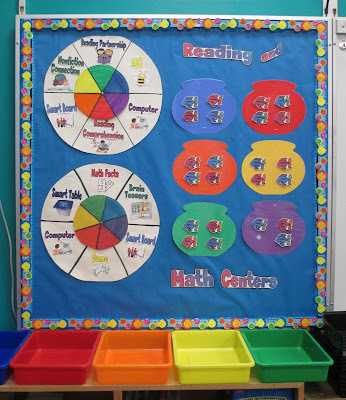 This year, I have combined my reading and math center wheels onto one board. Since I group students heterogeneously, I plan to use the same groups for centers in both math and reading. 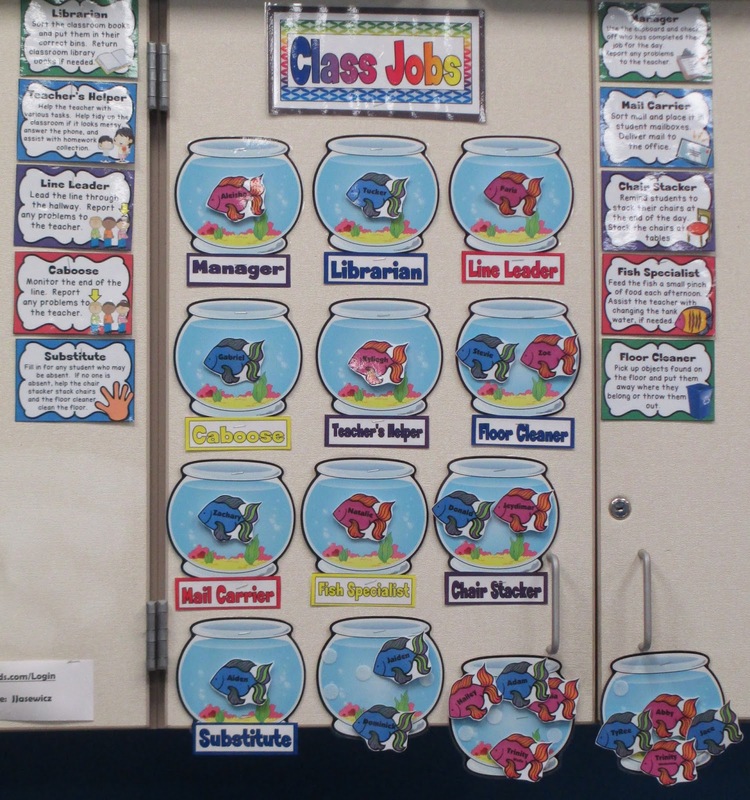 Students' names are printed out on the fish and they are velcroed to the fish bowls to show which color group they are in. Each day I rotate each center wheel once to the right so that students know which center they are responsible for. 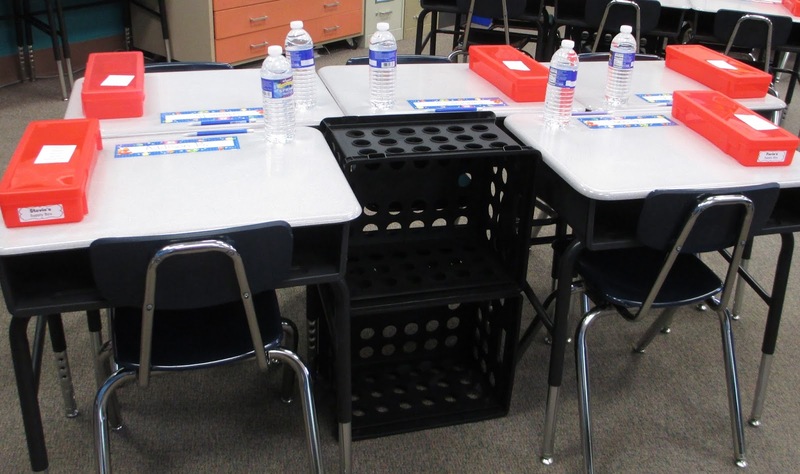 The colorful bins below are used for students to turn their work in. I'm super excited to have purchased some brand new black crates from Walmart. I stacked two on top of one another and placed them at each group. I have students in groups of 4 or 5. 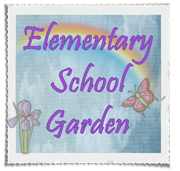 I plan to use these creates to store each groups' white boards, markers, erasers, glue, scissors, markers, their new red pencil boxes (that are currently on their desks), and their folders for various subjects. I'm hoping this will help reduce the clutter that builds up in their desks. Alright, that's all for now. Jennifer...I love the fish idea for bathroom signout! 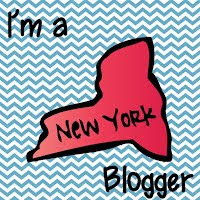 I am your newest follower as well as a neighbor down the thruway in Rochester! HUGE Back to School Giveaway!